Artichoke season has arrived! 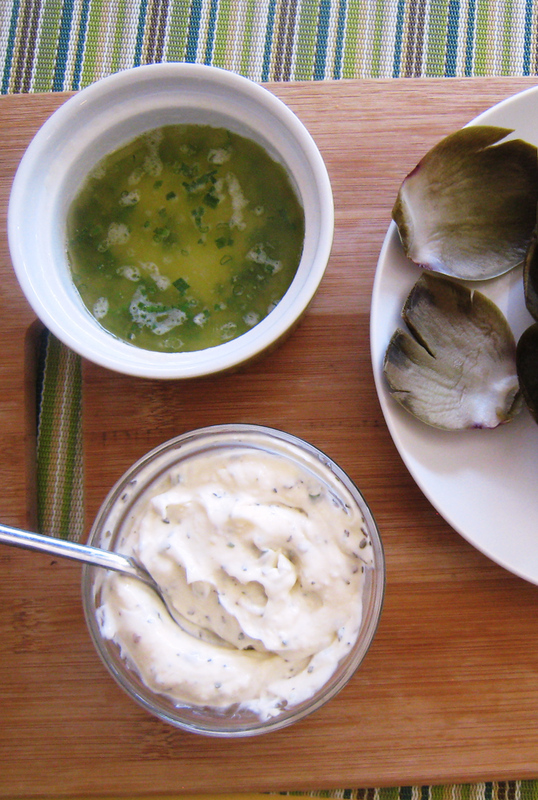 Having some choice of sauces for artichokes, like this lemon butter makes the experience so fun and delicious! I played my cards right in teaching my kids to like foods that my husband doesn’t love. He is not picky, but he doesn’t loooooooooove the same foods I do. That’s okay. It means that I don’t feel bad about fixing some of those foods as long as the kids like it. too. Vive the sauerkraut! Artichokes falls into the camp of things FishPapa likes, but wouldn’t probably go out of his way to buy or make. I don’t think he’s ever said, “Honey, I think it’s been awhile since we had artichokes.” But, my kids do! So, when my oldest son requested artichokes recently, I had to say yes! I love them as much as he does. I actually never had an artichoke until I met my husband. His Dutch friends, Sander and Vieke, lived on a mountain behind Santa Barbara. The night they invited us to dinner, I had my first tastes of red wine, steamed artichokes, and pasta carbonara. Lovely! It was a meal to remember! Nowadays, it’s my kids and I who enjoy the artichokes. We usually make two different sauces for artichokes. 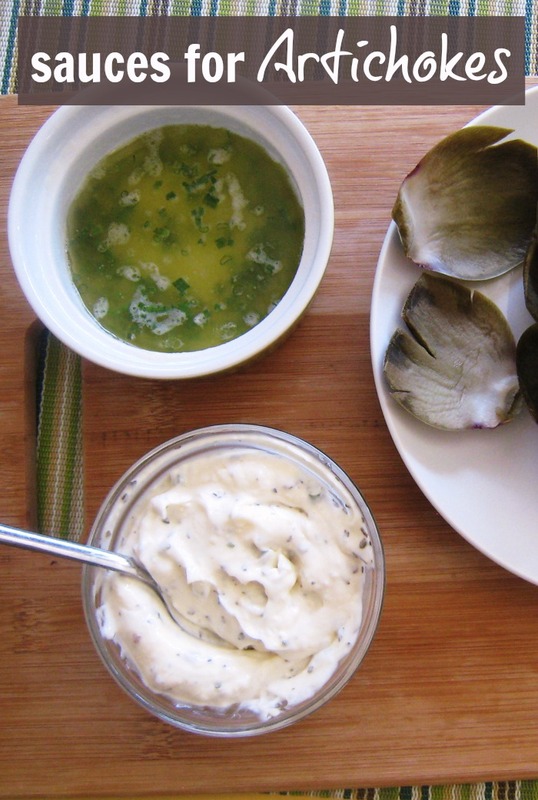 Here you’ll find a delicious lemon butter sauce for artichokes. 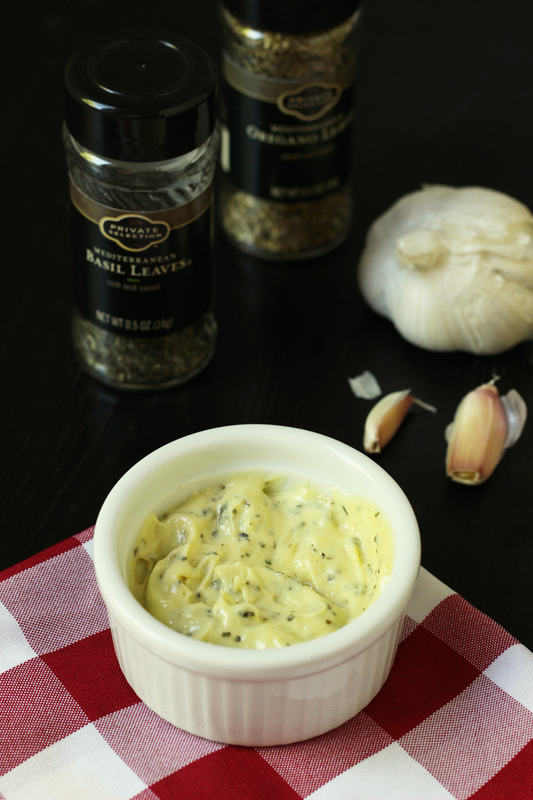 If you prefer something creamier, try this Herbed Mayonnaise. Enjoy those beautiful green globes now, peeling off their leaves to dip in one of two sauces. There’s something to please everyone. Not sure about how to fix one? Check out this tutorial for preparing artichokes for wrangling that prickly, mysterious globe of a thistle. You’ll be a pro in no time! In a small bowl, combine all the ingredients. Serve warm with cooked artichokes. 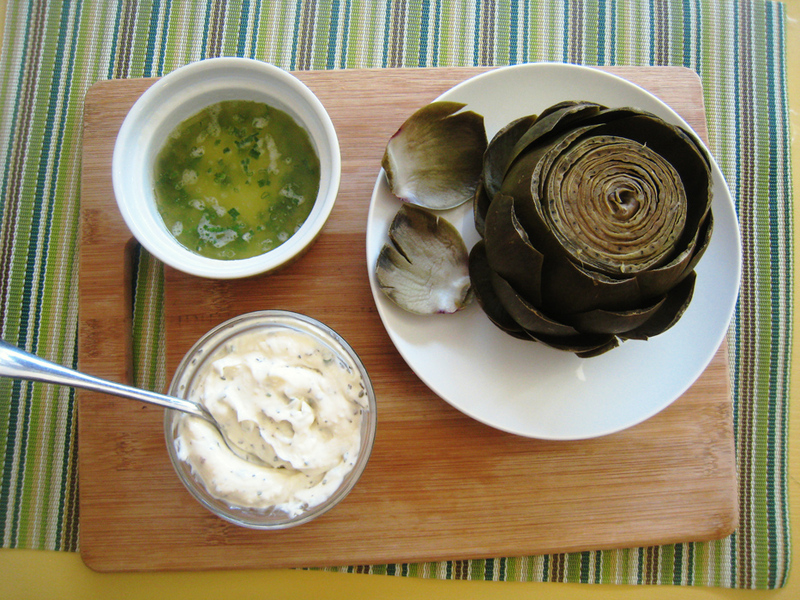 What are your favorite sauces for artichokes? I’m just a few minutes from the artichoke capital of the world and I’m SO glad! I like melted butter with garlic, salt and pepper. I’ll often add spices to the water when I’m boiling the artichoke (salt, garlic powder, cajun, etc) and that helps tremendously with the flavor. I always feel naughty dipping food in butter, lol, so boiling in flavor helps. My husband and I put butter, Worcestershire, and Pickapeppa in a ramekin in the microwave to make a yummy dip. It works best if you put the Worcestershire and Pickapeppa in before you melt the butter. Not happening at this house. You all can happily eat my share.